Over the past few years, one thing we have truly looked forward to each month is getting together with the girls to be creative. We have enjoyed monthly Craft Club meetings and more recently choosing a cookbook to plan a whole dinner party around in our monthly Cookbook Club. These girls seem to be up for anything! This time, we decided to try something different. 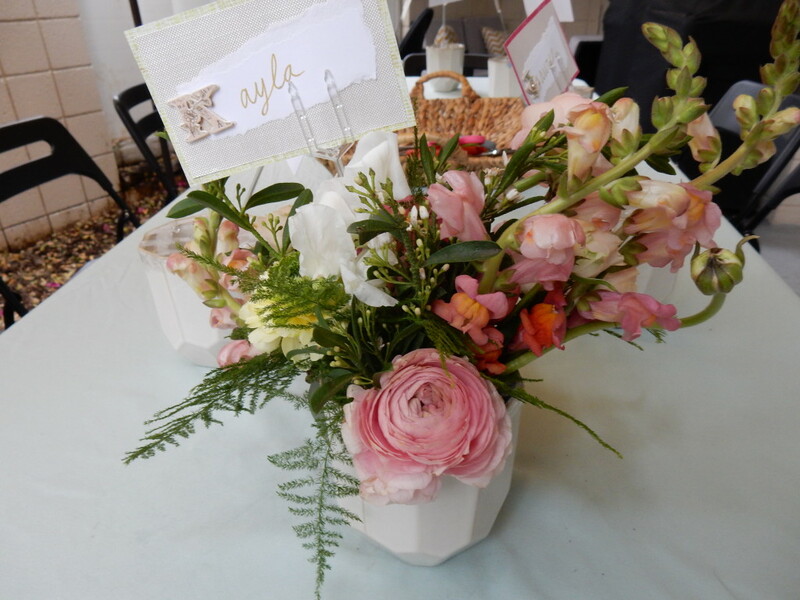 We invited our friends to learn some “tricks of the trade” from a real life floral expert and a valued vendor we have been using for all of our events, Kayla. An invitation sets the tone for the whole event. 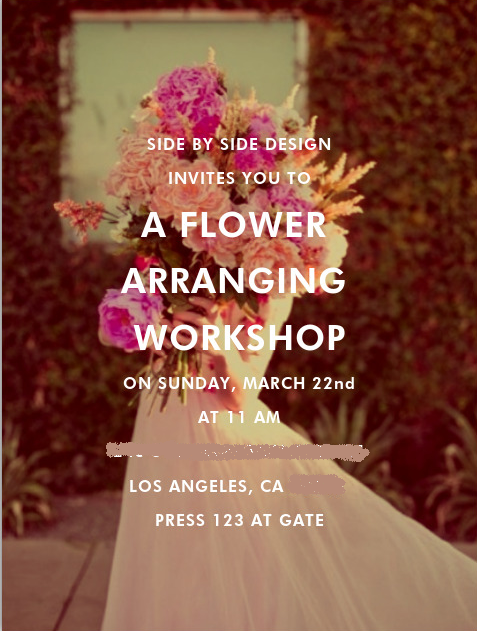 We created this online invite on Paperless Post using a photo we had found that inspired the whole look of our Flower Arranging Workshop. 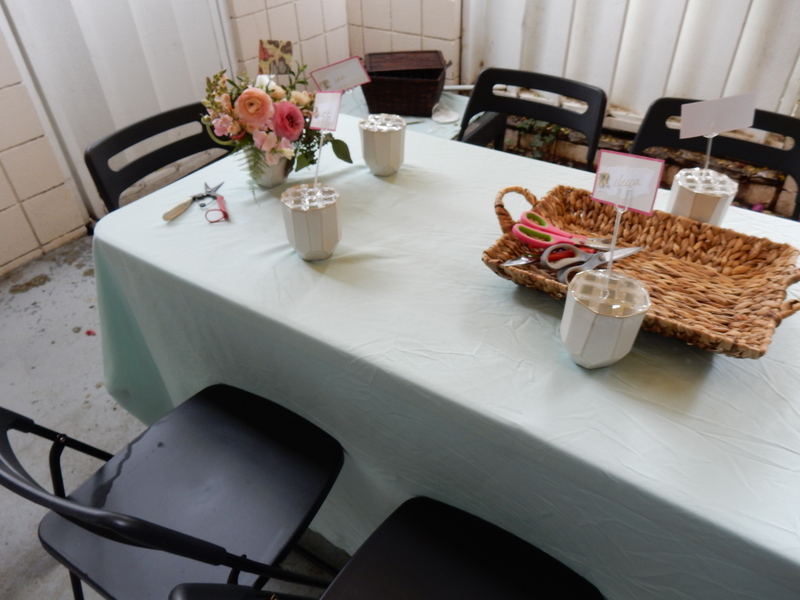 In addition to giving the girls all of the necessary information (including to bring a pair of scissors or garden shears) it allowed them to catch a glimpse at the color scheme which was so perfect for Spring. 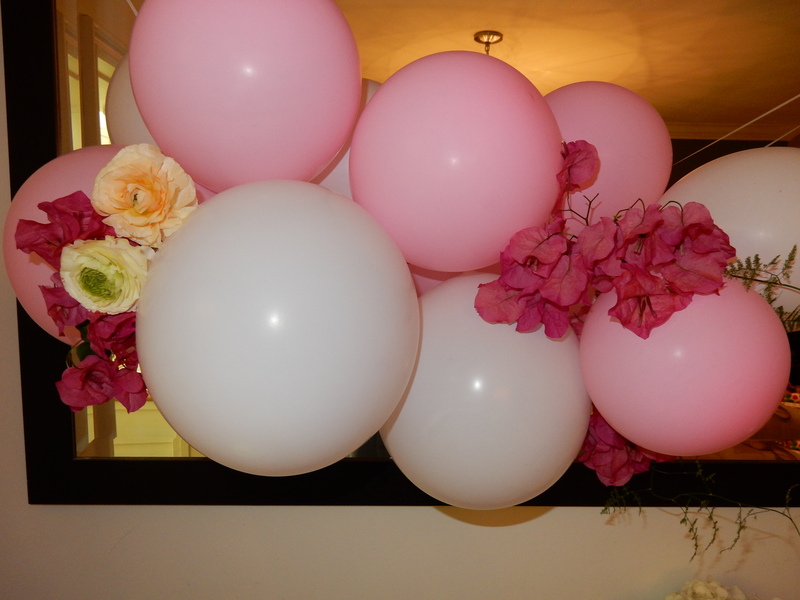 When our Guest of Honor, Kayla, first arrived she spruced up our decor with some fresh florals. 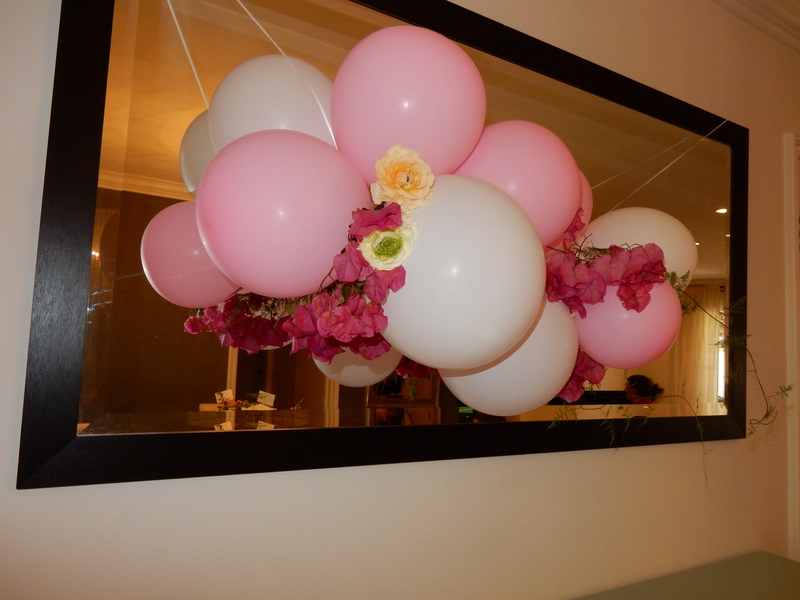 We had seen a beautiful photo on Pinterest of a balloon display with flowers in it and desperately wanted to recreate it. Kayla, of course, worked her magic! 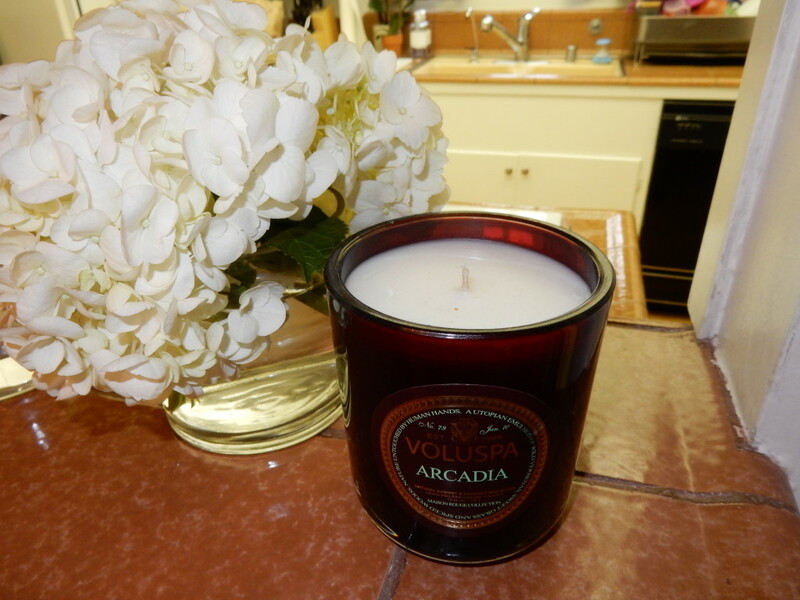 She also brought in white hydrangea to dress up the inside of Lauren’s home. 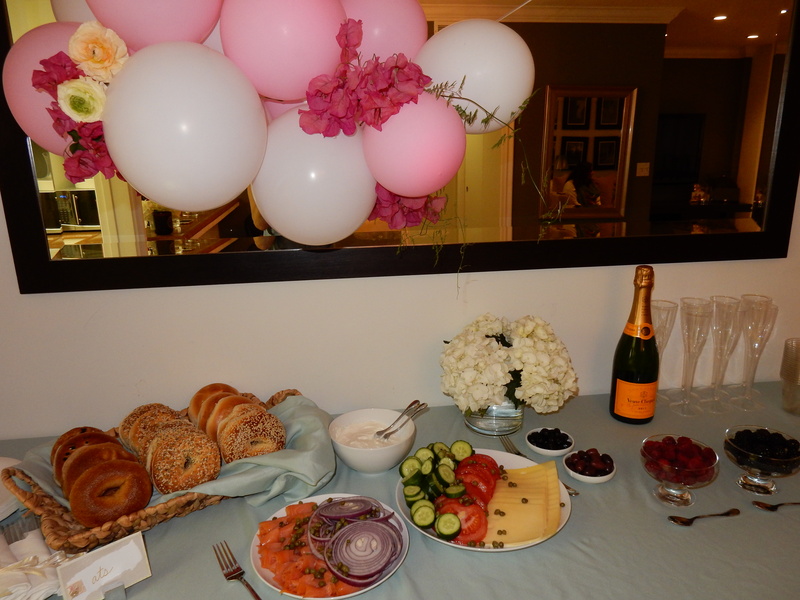 Upon their arrival, our guests had “Eats and Drinks” (as mentioned in our previous post, The Perfect Dozen); bagels with all the fixings and their own creations from our fun mimosa bar. 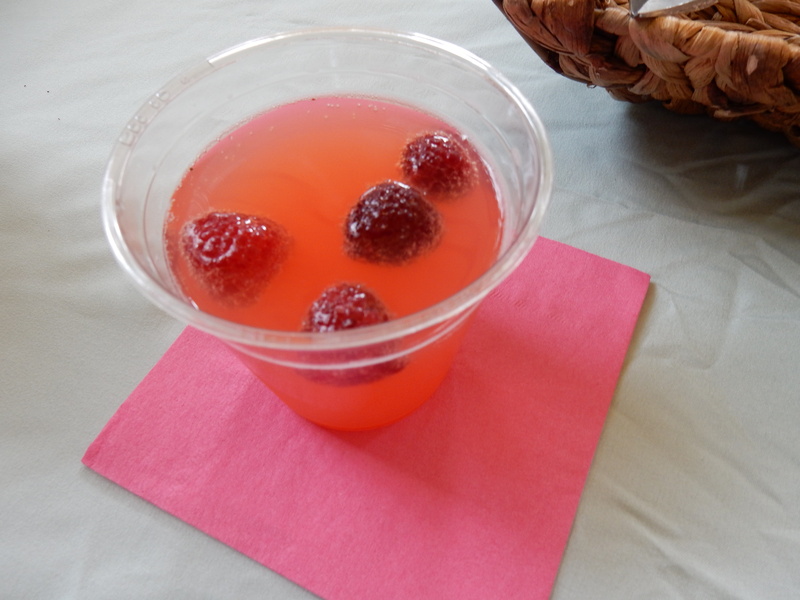 We included three different types of juice (orange, grapefruit, and cranberry), fresh fruit, and champagne of course. … and then there were the flowers! 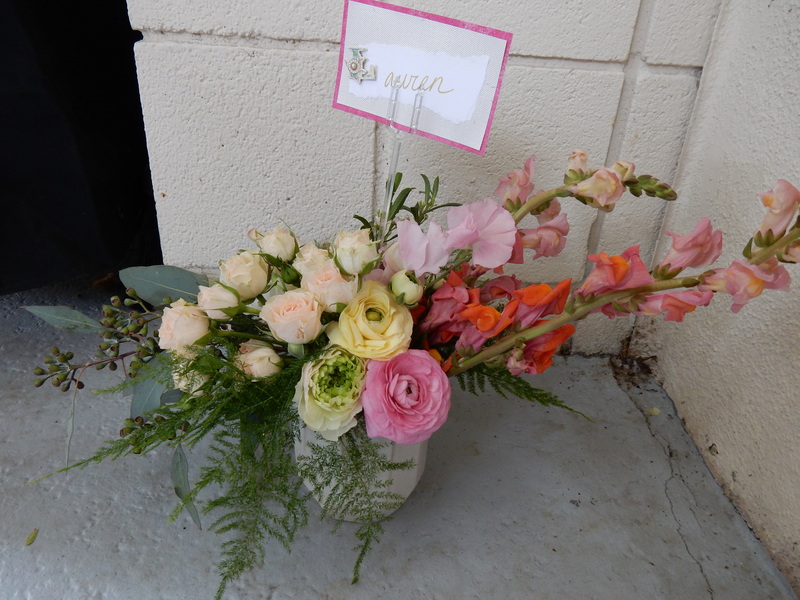 We were so thrilled with the selections Kayla made based on our inspiration photos we had previously sent to her; spray roses, runuculas, and snapdragons, just to name a few. 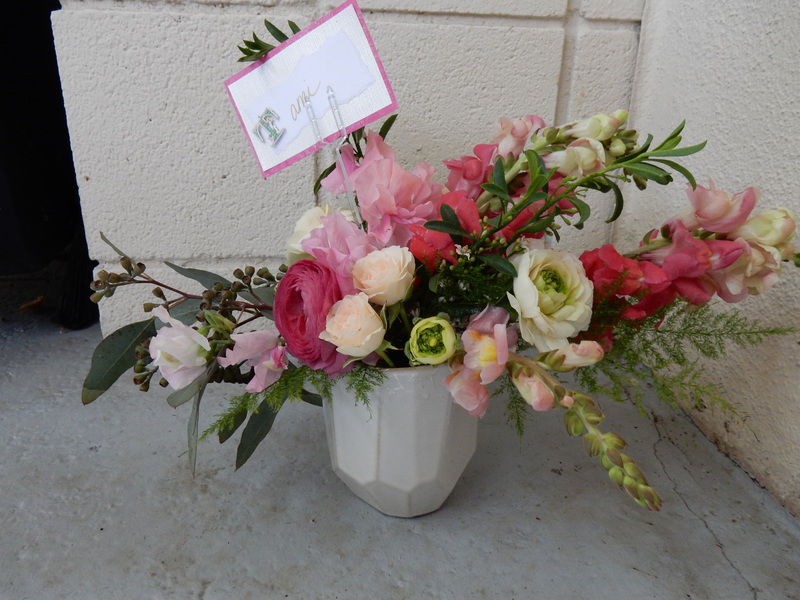 Step by step, Kayla walked us through the process of creating this beautiful arrangement. 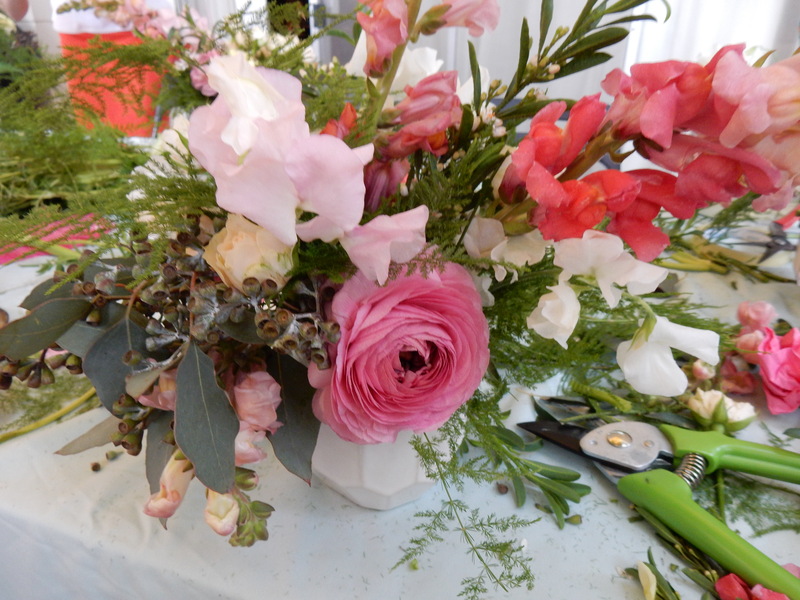 She gave us tips along the way should we choose to attempt this at home, or better yet try to make a whole new flower arrangement this Spring. As we mentioned, this particular group of girls are super creative, so it is not surprising that each flower arrangement had its own unique look (even though all of the same flowers and the same color palette were used). 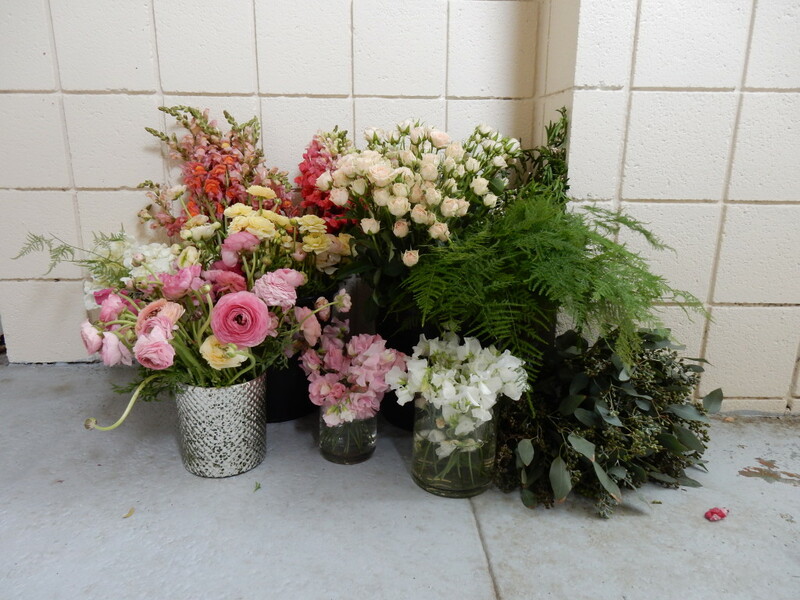 Having made many flower arrangements before, we were really excited to get some tips that we would be able to use in the future. Kayla, as a teacher, over exceeded our expectations. She was patient and willing to answer any questions we threw her way (and believe us there were lots!) As you can see from the above photos, we took our job as students very seriously as well and were super happy with each of our end products! 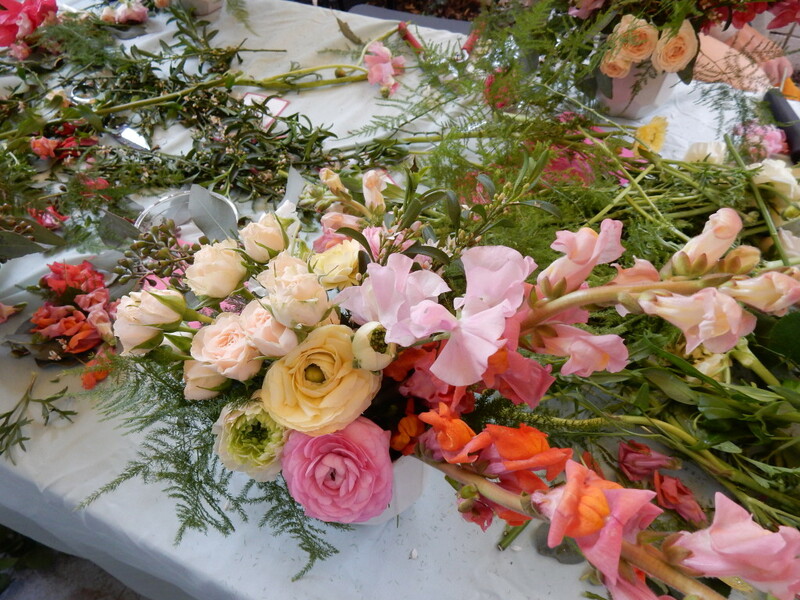 Want to throw your own Flower Arranging Workshop? Contact us at info@sbsdesignla.com. 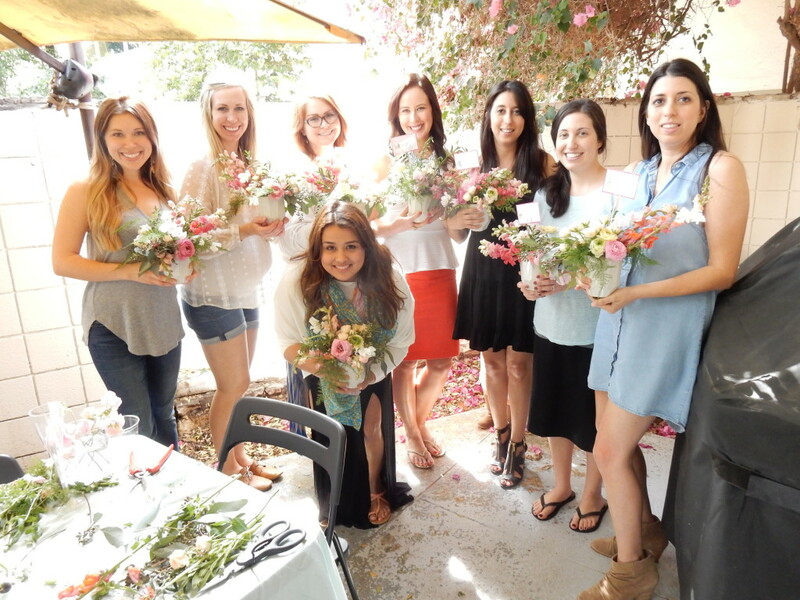 We would love to help you get your girlfriends together to recreate this awesome event in a new way. We love bagels! 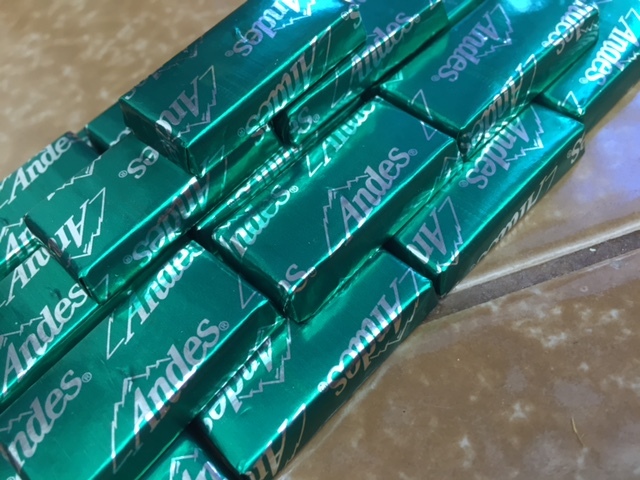 In fact, as far back as we can remember we have been enjoying this special treat during daytime family gatherings (and even sometimes at night). Until recently, we just assumed that having brunch meant that there would be bagels involved. It never even crossed our minds that this may not be the norm. Growing up, our grandparents would frequent their local bakery or Western Bagel (our favorite) and we would always make special requests for our top choice. 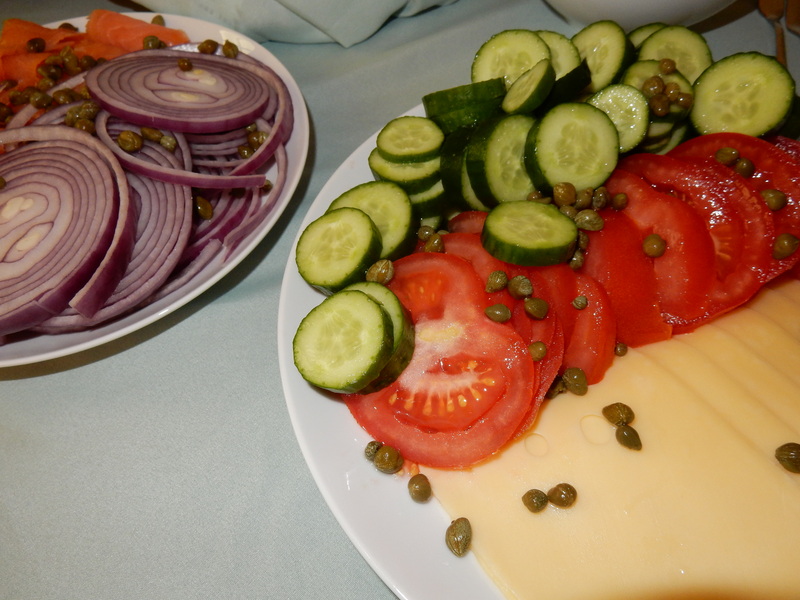 We would sit around the dining room table and pass all types of toppings from one person to the next; lox, cream cheese, tomato, etc. Now that we are older not only do we still have this family tradition, but we have brought it into our own homes as well. This made us think, though about ordering “the perfect dozen”. What does that consist of? How many do you get of each? Should it be equal, based on who’s eating, or is there a standard amount that should work well every time? We decided that there should be some sort of equation involved with ordering “the perfect dozen” when at your favorite bagel spot. We created a fun little rhyme to help us remember our order as well. 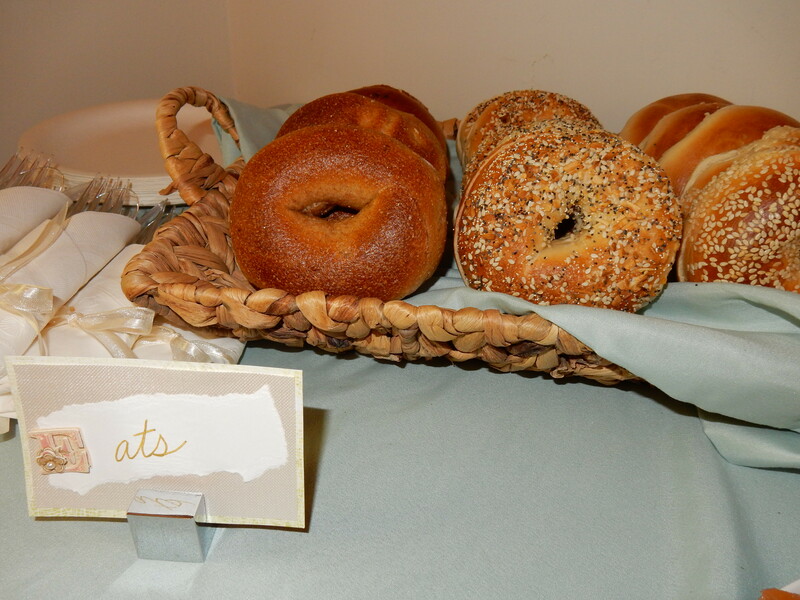 When planning your next bagel brunch, using this equation will help make sure everyone in attendance is happy. Can’t say it’s foolproof, but for the most part it should work every time. 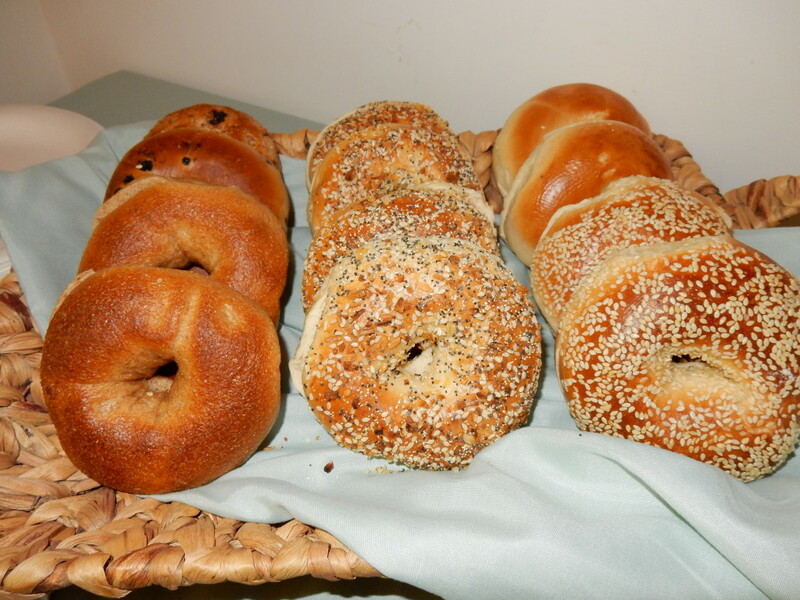 You heard it here … Side by Side Design’s bagel order is as follows: 4 everything, 2 plain, 2 wheat, 2 sesame, 2 sweet. 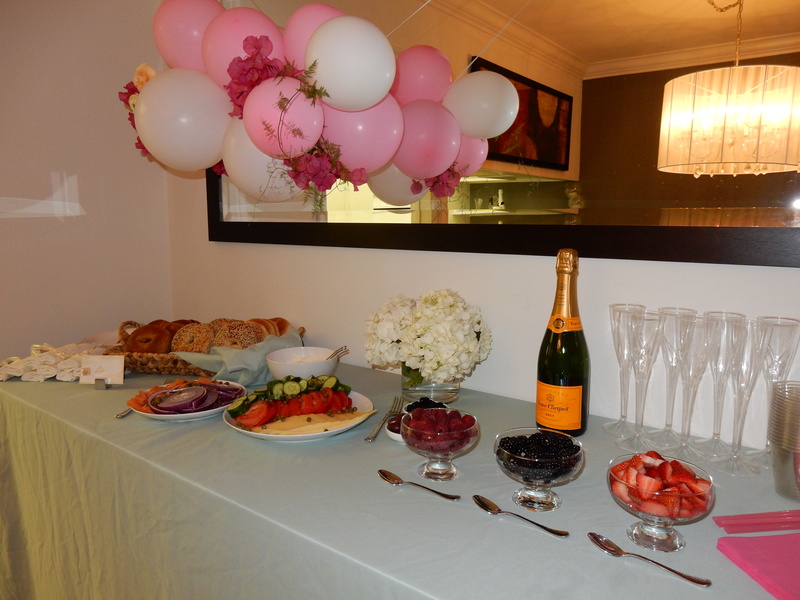 This past weekend, we invited the girls over for a special treat. 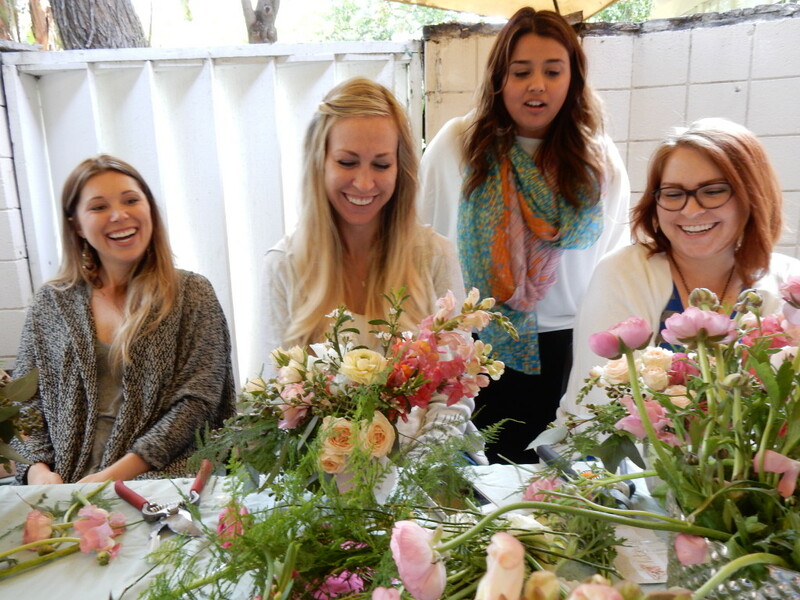 Stay tuned for details from our flower arranging workshop with our expert Kayla on Monday. 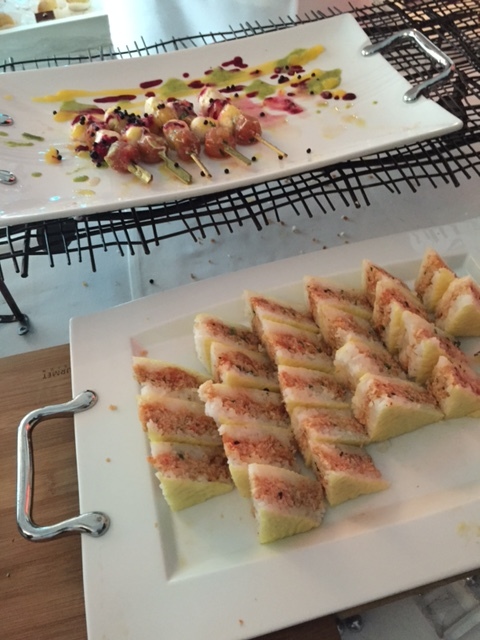 It is important to us when hosting to always include a nice spread. 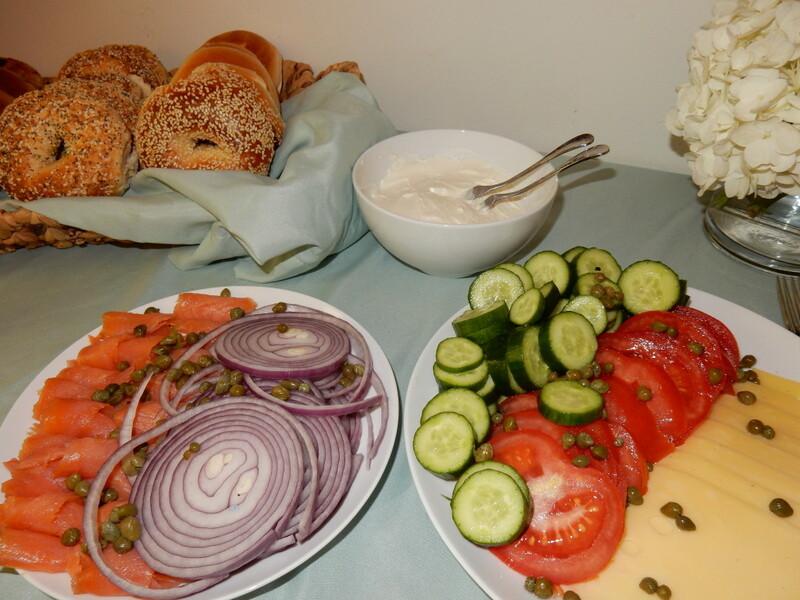 We set out our “perfect dozen” plus more bagels and all the fixings … a delicious platter of lox, onions, and capers, and another with sliced tomatoes, Persian cucumbers, and Swiss cheese. It’s always nice to have a variety of bagel toppings to make sure everyone gets to create theirs the way they like it best. Oh, and don’t forget the cream cheese! The next time you set out to host brunch for family or friends, we hope you will remember these little tips. We still believe that the key to any brunch menu is in “the perfect dozen”. Have a great weekend from Side by Side Design! 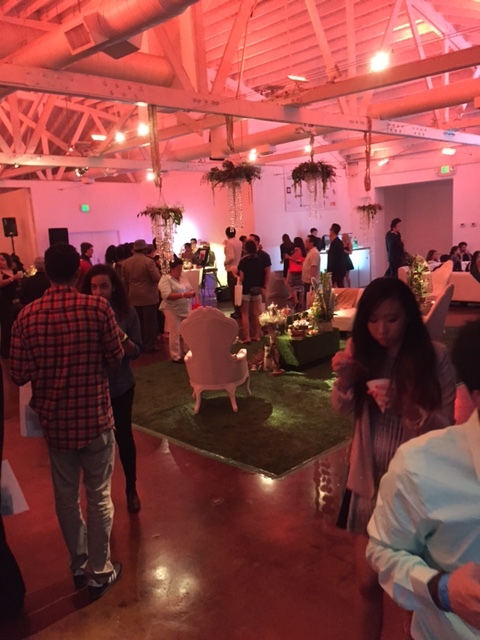 This past weekend, we had the opportunity to attend the Los Angeles Crave Expo. This event is a way for chefs and caterers to showcase their work for others in the event industry. 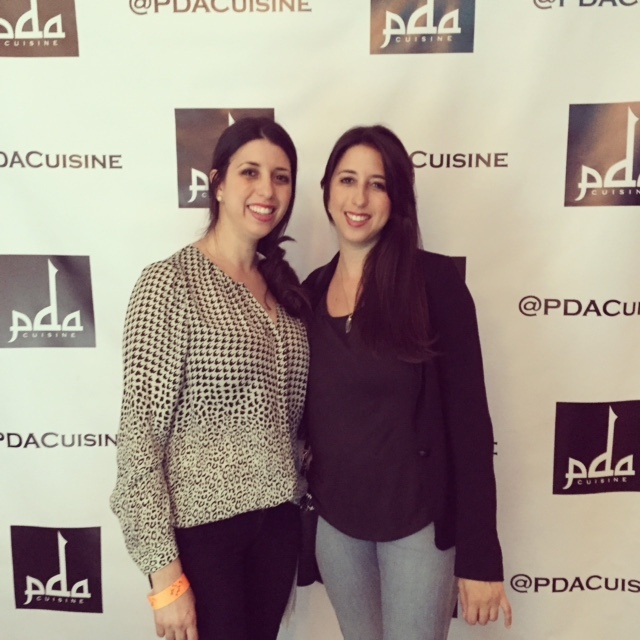 In fact, event planners from all over Los Angeles and its surrounding cities were found sampling delicious appetizers, drinks, and lots of sweets. We found attending this event extra beneficial in that we now have many new options for food in our back pockets. Plus we know it’s all good … since we pretty much tried it all! To give a small snapshot of our experience at this awesome event, we have put together photos of a few of our favorite booths. Who knows, maybe we will even get the opportunity to use one of these vendors for our next event. The fabulous servers from Mr. Bartender quickly whipped us up a cocktail upon our arrival. 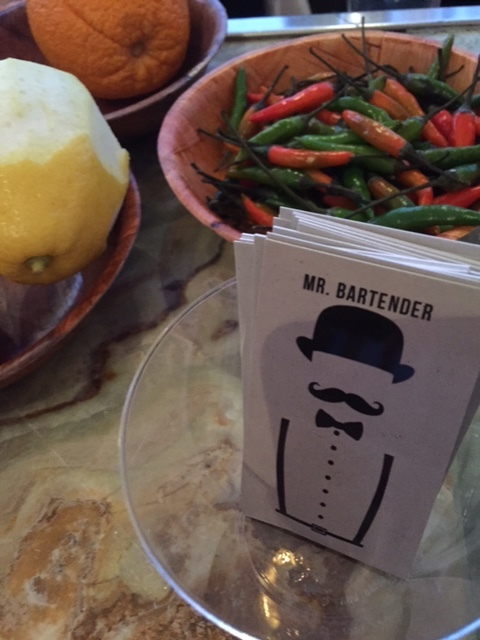 They added these chili peppers to a tequila mix for a bit of a kick. What a treat! 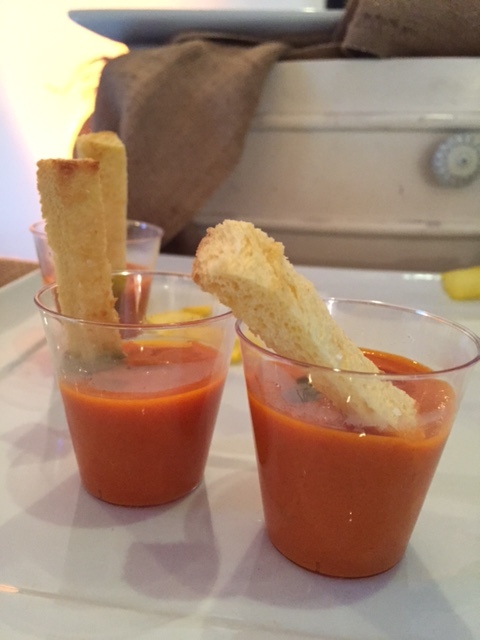 We enjoyed delicious cups of tomato soup and paper cones filled with kale salad made by The Mark for Events. Caprese on a skewer? Sushi sandwiches? We truly appreciate the creativity Caffe Concerto put forth. 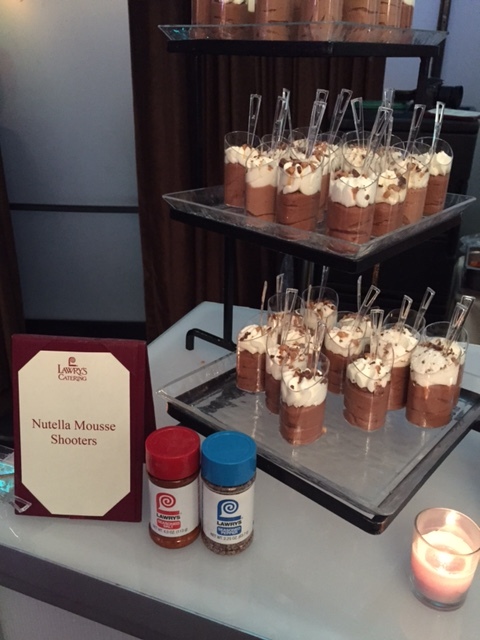 These Nutella mousse shooters were to die for, but we expect nothing less than perfection anyways from a name like Lawry’s. 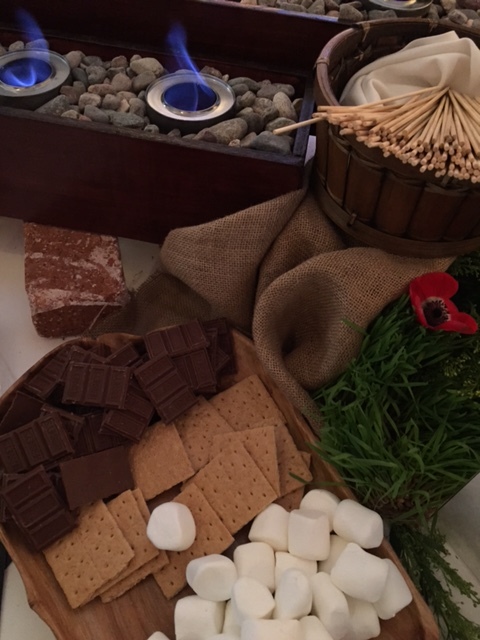 No event is complete without a s’mores bar. Especially if you are as obsessed with s’mores as we are. The Mark definitely knew what they were doing! The event coordinators for this event really pulled out all the stops! 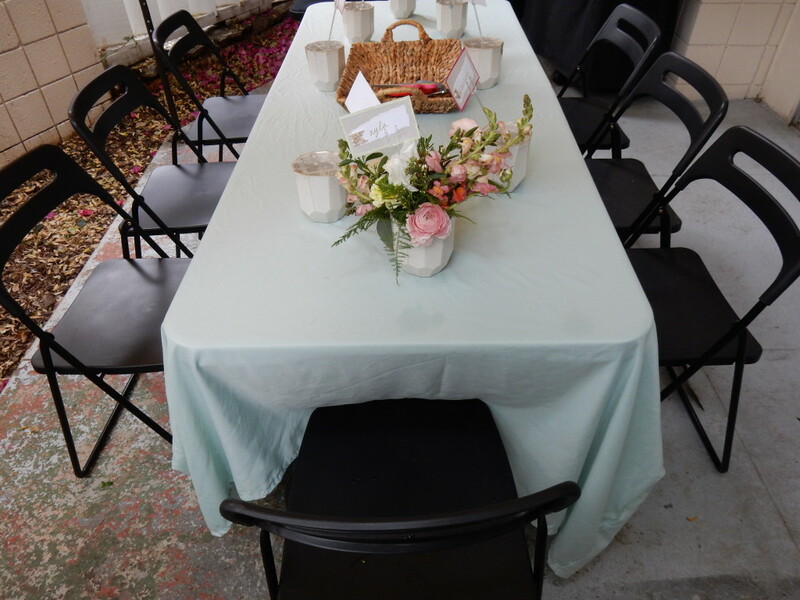 Not only did they find the best of the best local cuisine for us to sample but they created an event that any planner would be proud to say was their own; raffling off prizes, hiring a DJ to play endless tunes, and even setting up a small hair salon for additional vendor suggestions. At the end of the night we even got the chance to pose for a fun sis pic! Planning your next event? What do you “crave”? Thanks to Crave Expo, we’ve got lots of recommendations for you! With the start of Spring this past Friday and Easter coming up, baskets full of fresh fruits and other goodies seem to be in season. 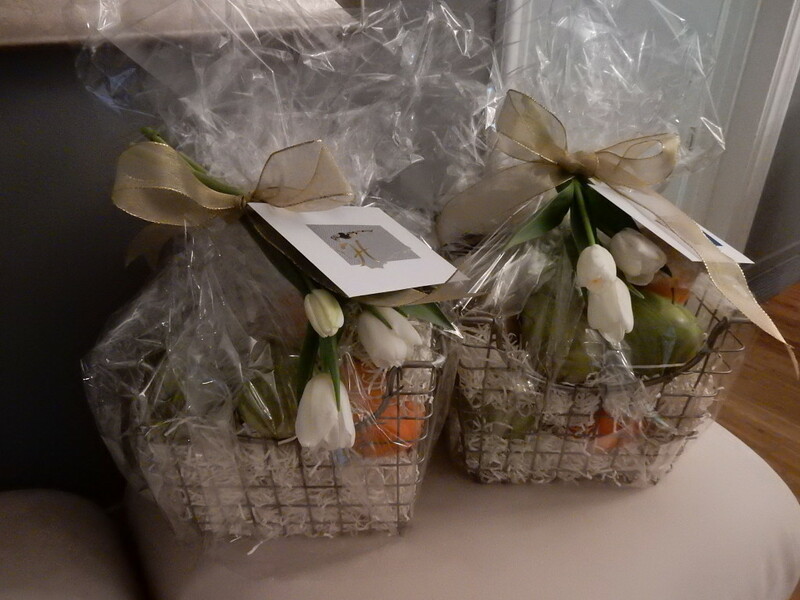 Today, we are showcasing some very special gift baskets that we put together and are perfect for Spring. We will take you through the steps we took to make our own vision come to life sharing tips along the way for those of you hoping to create your own Spring gift baskets. The first step was to gather all of the materials we needed. 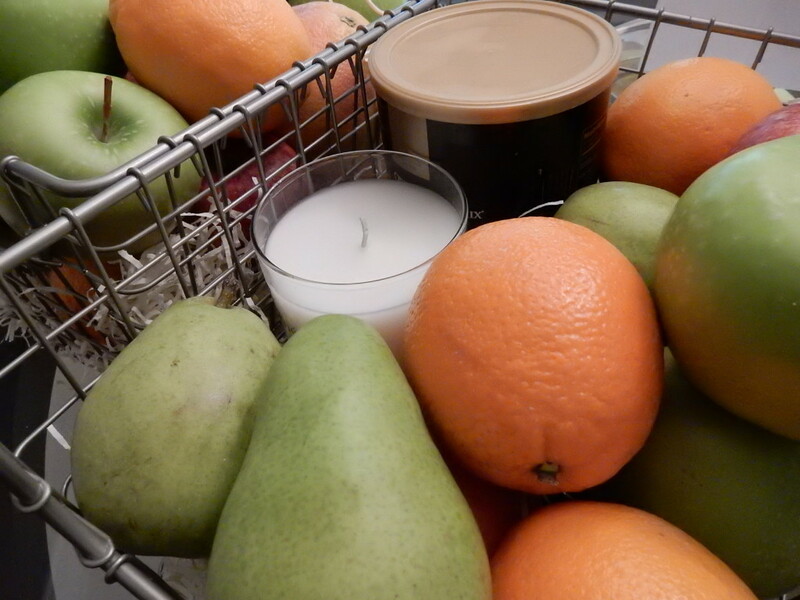 Some things like the basket itself, a nice smelling candle, and a container of mixed nuts can be purchased ahead of time as they don’t expire (or not so quickly at least). We found all of these items at our local Marshalls. It helped to keep our options open for what we wanted to fill our baskets with as you never know what you might find in these types of stores. Other items such as fresh fruit and flowers were gathered immediately before the baskets were assembled so they would not perish. The next step was to create our signature handmade cards for each basket recipient. We included pops of beautiful Spring colors such as hot pink and yellow to an otherwise navy, gold, and silver color scheme. 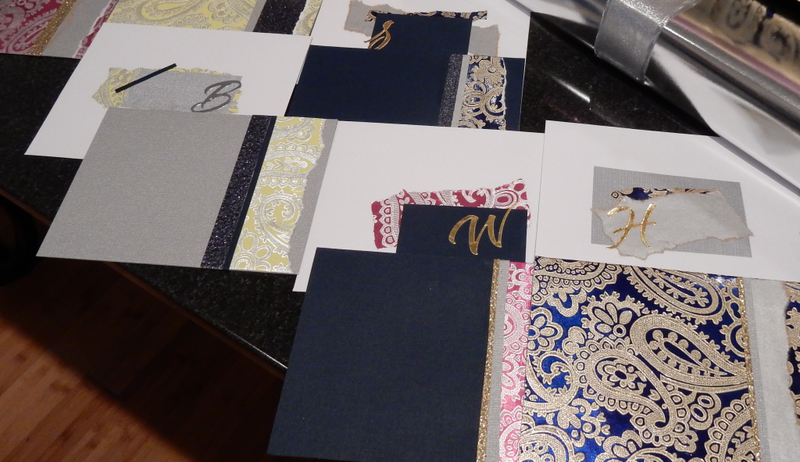 Each card was finished off with a gold cursive initial. 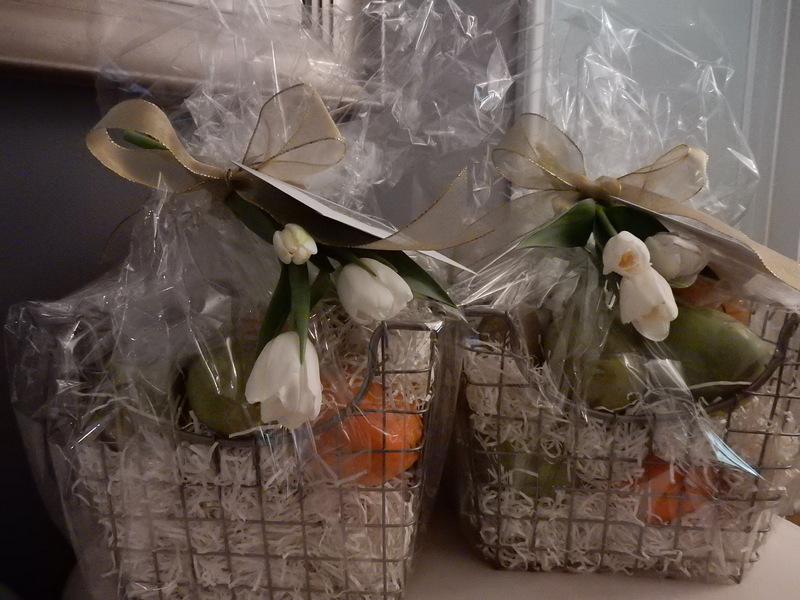 To make each basket look full to the top, we covered the bottom with paper filler. This had a really cool effect in these simple wire baskets. We then placed each of our purchased items on top of the filler creating a nice display with a large variety of fruit. Other items you could use include “things to keep” such as a picture frame, a bottle of champagne, or anything else that is personal to the recipient. We then wrapped each basket in clear cellophane and tied them off with large gold bows. The cards we made were attached as well. 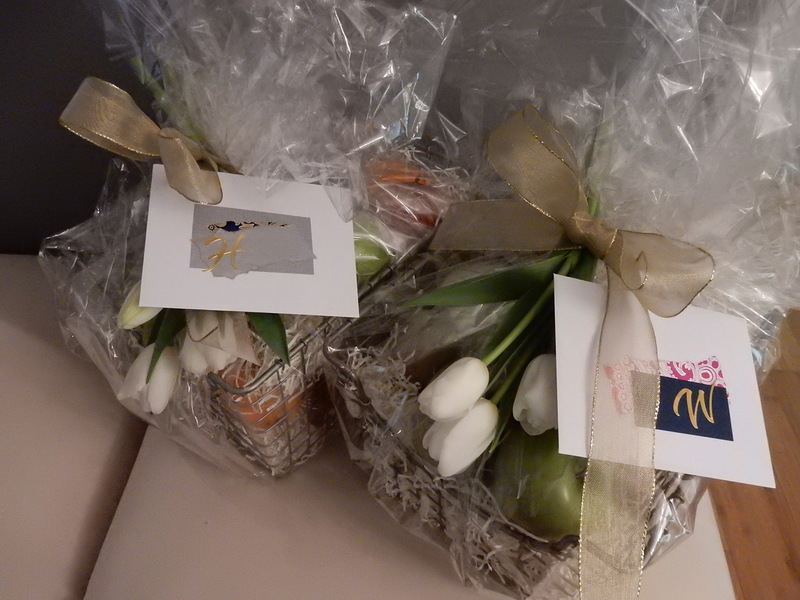 Our favorite design element of these particular baskets were the white tulips that we added at the end. 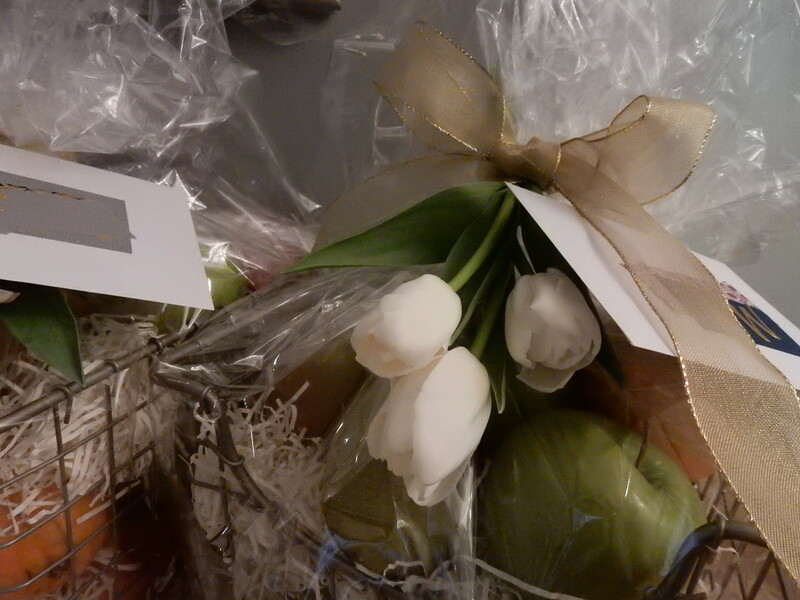 They really helped to make these gifts even more special and added a fresh touch which is perfect for Spring. Whether you are putting together a basket of treats to give this Easter or looking for a special gift for any event you have coming up, keep these tips in mind and remember a handmade card, a bunch of fresh flowers, and the basket itself make it so that your gift basket will be remembered for more than just what’s inside. St. Patrick’s Day is over, but it is never too late for a little something green! This past Tuesday, Lauren took her daughter Ava to a friend’s house and so as not to show up empty handed, she decided to whip up a simple batch of cookies. However, we never really like to just do the standard expected variety so Lauren went in search of a fun green option on her favorite online spot … Pinterest! 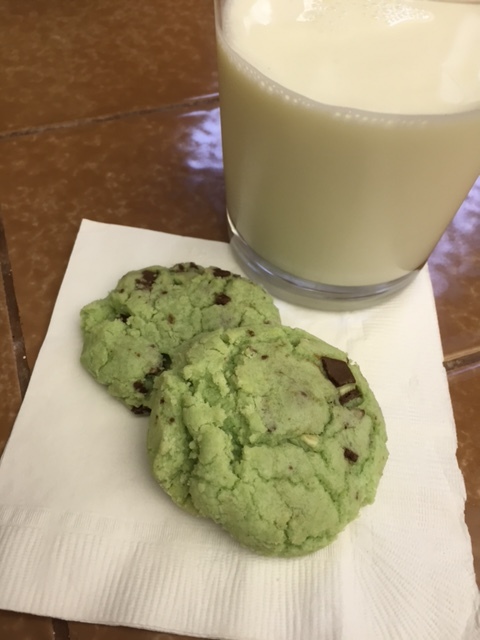 The recipe she used (and modified) was one that tastes like mint chocolate chip ice cream but in cookie form using Andes Mints as the highlighted ingredient. How can you go wrong with that? 1. Preheat oven to 300 degrees. 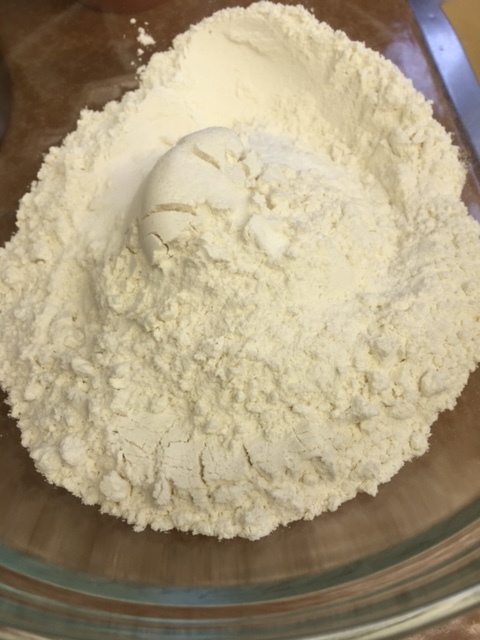 In a medium sized bowl, mix together 2 1/2 cups flour, 1/2 teaspoon baking soda, and 1/4 teaspoon salt. 2. In a separate bowl, mix together 1 1/2 cups sugar and 2 sticks softened unsalted butter. 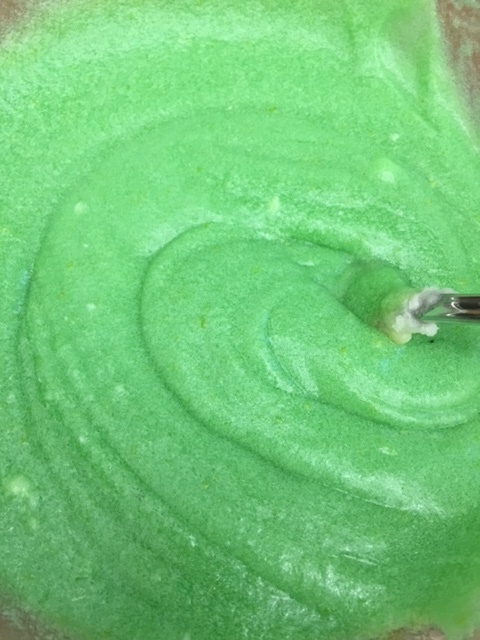 When creamy, add 2 large eggs and a few large drops of green food coloring. Mix all ingredients together. 3. Combine the two bowls (wet and dry ingredients) into one, and mix all together. 4. 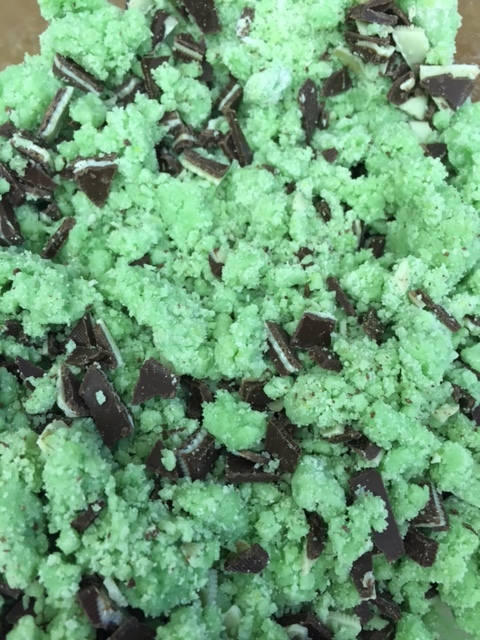 Chop up the whole package of Andes Mints and mix into the cookie batter. 5. 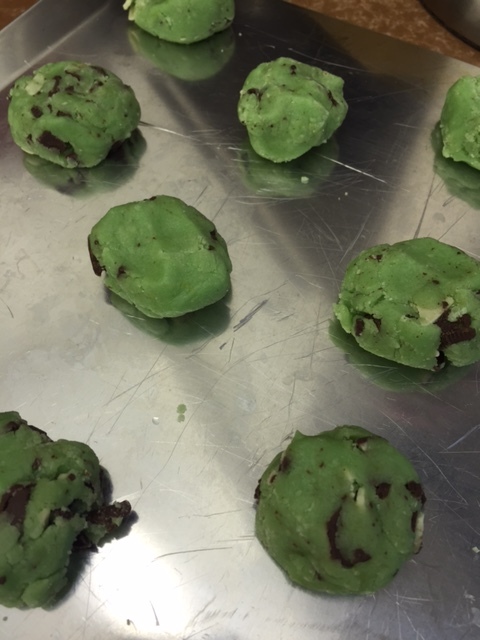 Create tablespoon sized rounds on an ungreased cookie sheet and bake for 18 minutes. 6. Enjoy with a cold glass of milk! Our week of green inspiration (from eco-friendly events, to the wall coloring in an outdoor courtyard, and even these delicious cookies) is coming to an end here on our blog. We hope you all had a lovely St. Patrick’s Day and kept the pinching to a minimal! Have a great weekend from Side by Side Design!